I first came across this producer about 2 years and a few months ago, during my first week at the store as the new Wine Buyer/Manager and store co-manager. I was tidying the temperature-controlled cellar downstairs and pulled a wooden six-pack case of “Montevertine Pergole Torte” 2001. I didn’t know anything about it and never really heard of it before, but the attractive, unusual and soft pinkish colorful label, representing in a very artistic way the visage of a lady, immediately charmed me. The case was open and I put a bottle aside on a wine rack next to me, which was, I discovered soon after, totally unsteady. Trying to move a case of another wine in the cellar, I accidentally push the bottle, which broke in two pieces on the floor. I thought that it was a good beginning, not even there for a week, and I already broke an expensive bottle of wine. As I tried to clean the mess, I realized how expressive and aromatic this wine was. It was delightful and pleasant. So I decided to continue reorganize the bottles of the cellar, gratefully intoxicated by the smell of this incredible wine. I ended up trying the wine at some point a few months later. It was one of my most revealing experiences among all the Tuscan wine I tried in my 18 years working in the wine business. We just bought Montevertine “Le Pergole Torte” 2004 vintage and “Pian del Ciampolo” 2007 from Rosenthal, 2 young wines that also deserve your attention. Situated in the heart of the Chianti district, Montevertine was first developed in the 11th century and was purchased by Sergio Manetti in 1967. The first vintage from Sergio was the 1971. Due to Signor Manetti’s devotion to the Sangiovese grape, all of his wines were produced nearly exclusively with Sangiovese. The Montevertine estate is now in the hands of Martino Manetti, son of Sergio, who remains dedicated to the style and philosophy of his father. The Montevertine estate constitutes approximately 10 hectares of vineyards planted almost exclusively to the Sangiovese grape. Small amounts of Colorino and Canaiolo are planted to supplement the Sangiovese, and a touch of Malvaisia. Wine production at Montevertine is essentially devoted to three wines. 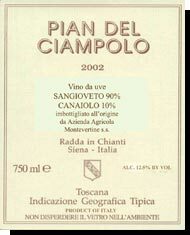 "Pian del Ciampolo", composed of Sangiovese with a tiny amount of Canaiolo blended in, is the basic red wine of the estate. It sees 18 months of aging in large barrels and is the most precocious of the wines. "Montevertine" is the standard bearer of the estate. It is aged 24 months in large barrel and is based on at least 90% Sangiovese with some Colorino added. and "Le Pergole Torte" is the prestige wine of Montevertine and is not produced every year. This ultimate wine is aged in large barrel for 18 months and then racked into small French barrels for the final stage of its elevage (ageing process). It is produced exclusively from Sangiovese. After a manual harvest, the wines are fermented in large (150hl) cement cuves (vats) for at least 25 days. The malolactic fermentation also occurs in large volume in cement cuves (vats) before it is racked into both small (Alliers oak) and large (Slavonian oak) barrels for 18 to 24 months, depending on the cuvée. The wine is never pumped, all movement of the wine is by gravity, and the wines are bottled without filtration and then held in bottle for at least 4 months prior to first release. 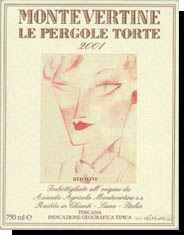 From the acclaimed 2001 vintage and made from 100% Sangiovese grapes aged for 18 months in large Slovenian barrel and rack into smaller French barrel for the final stage of the aging process, Le Pergole Torte is a classic, earthy, very expressive, aromatic, balanced and harmonious wine. Beside his bright garnet-ruby color of light to medium intensity, this wine combines red and dark berry fruits aromas with floral, liquorice, cider wood, tobacco, underbrush and earthy notes. The palate is soft, refined, elegant, integrated and vibrant at the same time, with great acidity lifting the fruit towards the lingering finish. The tannic structure nicely framed this gorgeous and flavorful Tuscan landscape depicted in this wine. I loved it. Wine lovers should make a point of finding some bottles to complete their own cellars. Here again, same vinification as the previous one from another classic vintage in Tuscany, Le Pergole Torte 2004 is a beautifully crafted wine with promising ageing potential. Obviously younger, it bursts lovely, refined yet present tannins that will need a bit of time. The delicate floral scent intermingled with the red cherry and dark berry aromas and hints of oak spice and earth are the feminine and attractive signature on the nose. Although, a bit tight, the palate is already defined and refined yet it will take a few more years to integrate and express its full potential. Decant it if you would like to taste a glimpse of this very promising wine. A blend of mostly Sangiovese with Canaiolo grapes, aged eighteen months in oak and a further six in bottle, Pian del Ciampolo 2007 is a rich and traditional expression of Tuscany. Redolent of soft cherry fruit, spice, licorice, tobacco and oak, its earthy tannins and nice acidity suggest pairing with classic meat-sauce pastas, grilled meats and aged cheeses. The tannins are still quite tight and need a bit of time to be tamed and more integrated. Decant it to fully appreciate it or wait for it a few more years to fully discover its nuances.